I've been working on some changes to my designs in the past few weeks. My Pleated Everyday Bag is now available with an adjustable strap. The one above was my first run. In the future they will all have an adjustable strap long enough to wear across your body messenger style or as a shoulder bag . All my Messenger Bags will also have an adjustable strap. I am working on ways to make my handbags more functional. More pockets and storage ideas are in the works. I am also working on some completely new designs that I will be introducing this spring! Yesterday I found a comment on my most recent post from a lovely person who wrote that she blogged about my shop. I followed her link to " The raven and the writing desk" to discover that I am her Etsy seller of the week! Thanks so much! You can see the post here. She also has a shop on Etsy, The Rustic Owl, that sells fantastic all natural soaps, soy candles and more. Check them out! At the moment these are my absolute Etsy must-haves! Starting from the top, Moxie Designs amazonite necklace, Gaia Conceptionsshell collector dress and Kira Ferrer Designssea anemone stacking ring. All these would be great to wear together while strolling along the seaside on a summer day. Once again I am dreaming of warmer weather while New York City is covered with snow! Yesterday myWayfarer Purse in olive green corduroy with a flowered branch applique made it to Etsy's front page twice! The screen shot posted above is one of the gorgeous treasuries that was curated by an etsy administrator. It features gaiaconceptions, jibbyandjuno, peskycatdesigns, saraschalliol, accessoire, larimeloom, annarubyking, spartasoap, staroftheeast, jennski, elmstudios, ballandchain. The lovely treasury posted above was curated by Spazzy. She has a shop on etsy that sells beautiful handspun yarn. It makes me want to learn to knit! The treasury features tangentdesigns, getreadysetgo, peskycatdesigns, blockpartypress, helveticaneue, myissag, aspasia, thephotozoo, kirby, thepeachtree, poorrobin and ciaraobscura. Thanks Etsy and Spazzy for creating such fantastic treasuries and including my purse! In the next few hours I'll be adding some new handbags to the Pesky Cat Designs shop. The Pleated Everyday Bag posted above is made from red cotton twill and has an adjustable shoulder strap. It will be available in the shop this afternoon. Have a wonderful day! Its been pretty cold in New York City and warm weather seems so far away. But before you know it, spring will be here. A few days ago I received an email from a potential customer on Etsy asking about colors that would take her into spring. Although it's a personal choice, most people seem to prefer light colors versus dark colors for warm weather. In the past month I've sold a couple of handbags, posted above, to customers living in the United Kingdom. Every once in a while I post about my international sales. See Around the World, Destination: Australia, Destination: Newfoundland and Destination: Europe. Thanks to Etsy's website my handbags have reached destinations in Canada, Europe and the Middle East! My Wayfarer Purse with a flowered branch applique made it to the front page of Etsy yesterday! I did a search on flickr to find the screen shoot after I noticed that I got a lot of traffic on my site. The treasury was curated by an administrator at Etsy and featured skylarkstudio, geninne, theleatherstore, kelgwo, ginpins, everythingok, gaiaconceptions, abonneygirl, peskycatdesigns, artquirk, sixthandelm and seasprayblue. Beautiful picks Etsy! I actually own a lovely skirt by gaiaconceptions. I love all the items in this treasury and had marked a lot of these in my favorites a while back! The corduroy messenger bag posted above is a new design that's now available in my shop. More of these in a variety of fabrics and applique designs will be available in the shop very soon. I'll be posting work in progress and finished pieces throughout next week. It may look quiet in this part of my studio but I am busy photographing new handbags that I will add to the shop in the next few hours. Hope everyone is having a great day! It's Monday and I'm working in my studio. I decided to take a photo of my sewing station before I begin. Corduroy is the fabric of the moment. The handbags posted above should be completed and in my shop by tomorrow. I also plan to cut some fabric for a few new Pleated Everyday Bags. My first new messenger bag sold yesterday! I love its rounded flap design and the adjustable strap. I'll definitely being adding more of those to the shop as well. I've been daydreaming about one of those lovely wooden racks you can store all your thread on. My local tailor has an awesome one. I can see it through the window of his store when I pass by. My sweet cat is dreaming of one as well. So it's probably best that I continue to keep my thread safely stored away in my plastic containers. It was a nice daydream though! I've completed a new design for the new year. It's a messenger style bag with a rounded flap and an adjustable strap. The one above is made from a very thick 6 wale cotton corduroy in a rich steel grey. It will be available in my shop today for a special introductory price since it's my first sample. It's 11" tall, 10.5" wide, 2.5" deep and has two interior pockets. The strap length is adjustable from 29.5" to 48.5" so you can wear it as a shoulder bag or across the body messenger style! I still plan to make a few minor adjustments to the design such as making it a bit deeper. Also, I plan to make some without the adjustable strap depending on the fabric used. I have to admit it was difficult sewing the adjustable strap using the thick 6 wale corduroy. I'll be adding new Wayfarer Purses to the Pesky Cat Designs shop in the next hour or two. After I accomplish that I plan to start a new batch of handbags. It's raining in New York City right now so it's a perfect day to stay in the studio and work. When I have some new works in progress I'll post a sneak preview. 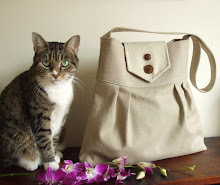 I'll be adding new handbags to the Pesky Cat Designs shop in the next hour or so. 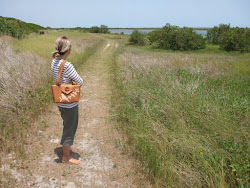 More purses will also be added to the shop on Wednesday, January 7th. New purses will be arriving at the Pesky Cat Designs shop this week. Wayfarer Purses will be available in corduroy, cotton canvas and denim hemp. I also have some corduroy Semi-Circle Designs. A heads up will be posted a couple of hours before new items are added to the shop. New handbags are in production at the Pesky Cat Designs studio. Posted above are some being created in corduroy, canvas and denim hemp. They should be available in my shop this Tuesday. Hope everyone is having a good New Year!